State-of-the-art infrastructure along with an excellent climate has powered Sochi’s rebirth. The 2014 Olympic Games has motivated local residents to go to gyms, jog, ski, and power walk. Sports tourism is now one of the city’s fastest growing industries. Sochi has many advantages for those that love to swim: 140 kilometers of developed beachfronts allow swimmers to take seawater dips all year long. Of course, swimming in 12 degrees Celsius is not for everybody, which is why there are swimming pools with heated sea and fresh water in all hotels and many sanatoriums in the area. 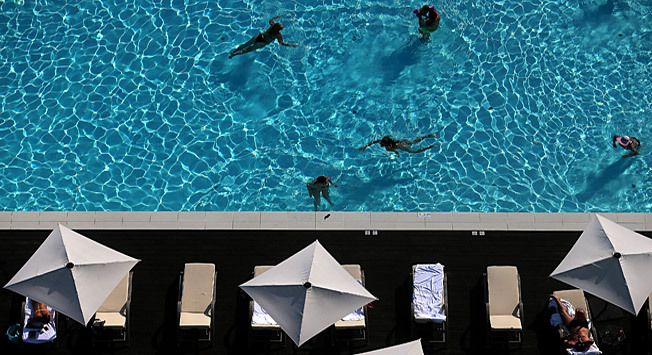 Even if staying at a small hotel, it’s easy to get a one-day pass to one of the city's swimming pools. Despite the mountainous terrain the area is full of great places for jogging. Locals especially like jogging along the spacious embankment along the Sochi River. It starts at the main city market and ends at the beach. There are always joggers at the seaside embankment and on a five-kilometer-long avenue along the Imeretinskaya lowlands. Outdoor exercise machines in Sochi were installed in parks and public gardens near the sea. In Frunze Park you can work on your abs and biceps beneath the shadow of the trees while at the same time looking out at the sea. Powerwalking along Sochi's health trails. A Terrainkur (German term for a health trail) is a forest or mountain path with a series of slopes and rises. Such paths can be found in Krasnaya Polyana at resorts such as Roza Khutor, Laura Gazprom and Gorki Gorod. The trails weave along the slopes of the Psekhako Ridge and the Aibga Ridge. There are benches for resting and great places for taking in views along the way. The longest trail (five kilometers) is in Khosta District. Open year round, it begins at the central stadium and reaches Matsesta going along the sea. Bicycle trails can be found along the river beginning at the “Moremall” shopping center and heading towards the sea along Navaginskaya ul. and then along Imeretinskaya Embankment. More bicycle rental stations are emerging all the time. Olympic Park has many of them, making it easy to see all of the Olympic stadiums in a quick ride. The resorts of Krasnaya Polyana feature several specialized routes for mountain bikes, with some located 1000 meters above sea level. There are trails for professional mountain bikers and beginners. Sochi presents wonderful opportunities for practicing yoga outdoors. There are early morning and evening group classes in Riviera Park, at Riviera Beach and at Krasnaya Polyana in summer. At Gornaya Carousel there is a forest tent dedicated to yoga. In summer Nordic walking at Krasnaya Polyana is quite popular. Instructors at Roza Khutor resort teach the basics of this sport, which is rapidly gaining popularity in Russia. Several horseback-riding schools operate in Sochi such as Kentavr in Matsesta and Dobezhiny's school in Khosta. Lessons for tourists are available. At Dagomys village one can master the basics of golf. There is a mini golf club where you can play 18 holes. There is another mini golf course in Olympic Park near the ice-skating center Iceberg, along with volleyball and basketball courts and a mini-football field. Recently a skatepark opened here as well. For tourists and sport fans Sochi features a motor-racing track, where a Formula-1 Russia event was held. There is also a “racing taxi” that allows tourists to ride shotgun around the track at incredible speeds. Professional drivers will take you around in vehicles such as the Mazda MX5 Aori, a Lamborghini Gallardo or a Ferrari F430, a “supercar” with a V8 engine and 510-horsepower capacity. Sochi is the native city of award-winning tennis players Yevgeny Kafelnikov and Elena Vesnina. At the age of six Vesnina started training on the courts of Riviera Park, which are open to everyone today. Tennis courts are available at ul. Chaikovskogo and ul. Vinogradnaya in Dagomys, in Adler and in many sanatoriums. By climbing, driving and even flying over on ropes between high trees in Sochi's rope courses you can be a rope-walker, mountaineer and Tarzan simultaneously. Rope parks can be found in Krasnaya Polyana and Panda Park at Roza Khutor. It is possible to go ice-skating all year round at the real Olympic palace in Sochi. The Iceberg training arena, where Evgeni Plushenko, Maxim Trankov, Tatiana Volosozhar, Yulia Lipnitskaya and others honed their skills before their performances at the Olympic Games, is now open to the public. At Sochi Sky Park visitors can access a huge climbing gym and a bungee jumping facility, while in Dagomys and on the top of Akhun Mountain a paintball battle can be arranged. There are rafting tours along the rivers Mzymta and Shakhe in summer. In Sochi there are opportunities to try mountaineering, rock climbing, and ride paraplanes and deltaplanes all year round. All of these recreational activities will enhance your journey to Sochi and give you a new perspective on Russia’s rapidly developing capital of sport.